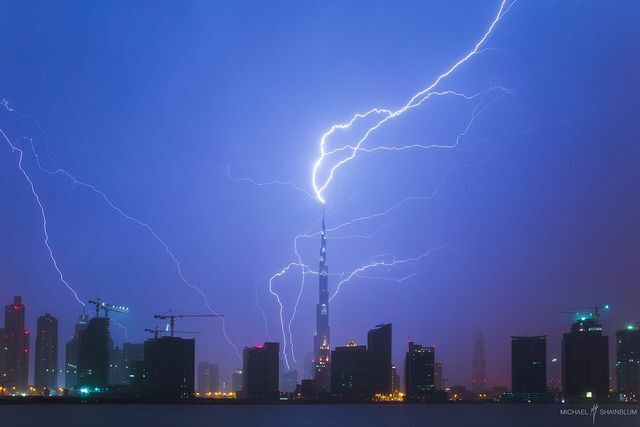 I stood out in the rain for 4 hours trying to get some kind of lightning strike around Downtown Dubai, I had no idea I would actually catch a lightning bolt hitting the Burj Khalifa. I was running a timelapse on two cameras during the strike. One camera was out by the water and one camera under some shelter. I noticed the rain started to get heavy and ran towards the camera by the water. By the time I got to the camera everything was soaked and the entire dirt lot had become flooded with mud and water. I noticed a giant strike and ran the camera back to the shelter to see if the 2nd camera had caught anything. This was the image I saw when I looked at the screen.